Has anyone else noticed how S’mores is all the rage these days? The flavor combination of chocolate, graham cracker and marshmallow is the epitome of summer, and so I guess it makes sense.. And now I’m seeing them at Starbucks. In bar form! 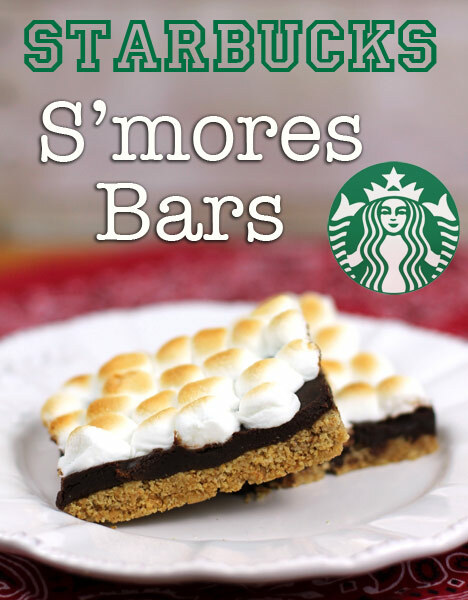 Starbucks S’mores Bars! Of course, I couldn’t let the “summer of the s’more” pass without sharing my own version. Remember this is NOT the same thing as evaporated milk (which is just milk with some of the water removed). Sweetened condensed is shelf stable concentrated milk that has been cooked down with sugar which makes it sweet and syrupy, like a dulce de leche. You can typically find it the baking aisle. In this recipe, the canned milk acts as the binding agent for both the graham cracker crust and the chocolate which allows you to to transform S’mores into layered bars. You will need the remainder of the milk later, so make sure to save it. Mix together thoroughly and microwave in increments of 30 seconds until the chocolate is melted. Stir and add vanilla. You should end up with a layer of chocolate and a layer of graham crackers. Finally, add a marshmallow layer and place it under the broiler to toast the marshmallows. This will only take a few seconds so keep an eye on it! This step results in the toasted caramelized flavor of a campfire s’more! My kids love the traditional S’mores flavored ones, but my favorite are when you add Butterscotch, it is another layer of flavor. So next time you are trying to come up with a quick dessert, look no farther than S’mores. A knockoff recipe of Starbucks' favorite summer treat. A graham cracker crust along with marshmallows and chocolate make it irresistible. Your kids will love it and it only takes about 15 minutes to put together. Step 3 Add butter and 1/2 cup Sweetened Condensed Milk. Step 4 Pack the mixture onto the bottom of the baking pan to form crust and bake for 5-7 minutes. Step 6 Spread onto crust with a large spatula (Tip: to keep the chocolate from sticking to the spatula, spray it with cooking spray) Melted chocolate on graham crackers You should end up with a layer of chocolate and a layer of graham crackers.